Generators are automatic sequential counters, spanning the whole database. They are necessary because all operations in Firebird/InterBase® are subject to transaction control. A generator is a database object and is part of the database's metadata. It is a sequential number, incorporating a whole-numbered 64 bit value BIGINT (SQL dialect 3) since InterBase® 6/Firebird (in SQL dialect 1 it is a 32 bit value INTEGER), that can automatically be inserted into a column. It is often used to ensure a unique value in an internal primary key. A database can contain any number of generators and they can be used and updated in any transaction. They are the only transaction-independent part of Firebird/InterBase®. For each operation a new number is generated, regardless whether this transaction is ultimately committed or rolled back (this consequently leads to "missing numbers"). Therefore generators are best suited for automatic internal sequential numbering for internal primary keys. SEQUENCE was introduced in Firebird 2.0. It is the SQL-99-compliant synonym for GENERATOR. SEQUENCE is a syntax term described in the SQL specification, whereas GENERATOR is a legacy InterBase® syntax term. A sequence generator is a mechanism for generating successive exact numeric values, one at a time. A sequence generator is a named schema object. In dialect 3 it is a BIGINT, in dialect 1 it is an INTEGER. It is often used to implement guaranteed unique IDs for records, to construct columns that behave like AUTOINC fields found in other RDBMSs. Further information regarding SEQUENCE can be found in the Firebird 2.0.4 Release Notes. Since IBExpert version 2017.01.15 it is possible to specify the initial value for autoincrement fields (GENERATED BY IDENTITY, Firebird 3) and restart them with the specified value. For legacy reasons, IBExpert will still continue to use the term GENERATOR alongside the term SEQUENCE. Generators can be created either directly in the SQL Editor or using the DB Explorer (refer to New Generator for details). Generally a generator is used to determine unique identification numbers for primary keys. A BEFORE INSERT TRIGGER can be defined for this, which increases the current value using the GEN_ID() function, and automatically enters it in the respective table field. Please refer to Create a trigger for a generator for more information. A generator can also be called from a stored procedure or an application. A database can contain any number of generators. Although up until the most recent InterBase® version 7.x the number of generators was limited to one data page. One generator uses 8 bytes, which means approximately 115 generators fit onto one page (at 1K). This limitation has been solved in the InterBase® 7.x version, and was solved in the Firebird 1.0 version. Using Firebird you can create more than 32,000 generators per database. The current generator value of existing generators is not stored in a table but on its own system data pages, as the table contents are subject to transactional changes. The generator value is also secured when backing up. Generators are database objects and are part of the database's metadata, and can be created, modified and dropped as all other Firebird/InterBase® objects in the IBExpert DB Explorer. Or in the Field Editor under Autoincrement (started by double-clicking on an existing INTEGER or SMALLINT field in the Table Editor). Or directly in the IBExpert SQL Editor, and then saved as a generator. Using the Autoinc page in the Table and Field Editors, the Create Generator box simply needs to be checked, and the name and starting value defined. where n is the initial generator value. SET GENERATOR can also be used to reset an existing generator's value. This however requires care, as usually the column(s) that receives the generator value is/are defined to be unique. For example, you would not normally reset customer IDs except under unusual and controlled circumstances. If this parameter is not used, the default STEP_VALUE with an increment of 1 applies. The Generator Editor can be started using the Database / New Generator menu item; from the DB Explorer, using the right mouse-click menu or double-clicking on an existing generator; or directly from the Field or Table Editor / Autoincrement. Please refer to New Generator when creating a generator for the first time. Here it is possible to create new generators, select an existing generator, and alter a generator. Please refer to New Generator or Alter Generator for details. In Firebird 2.0 the RDB$DESCRIPTION field was added to RDB$GENERATORS, so now it is now possible to include a description text when creating generators. 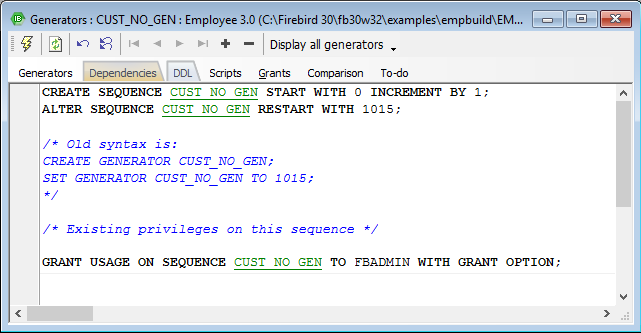 In IBExpert version 2014.09.15 support was added for the new Firebird 3.0 generator increment value (INCREMENT BY clause). Please refer to Table Editor / Dependencies. Please refer to Table Editor / DDL. Creating - displays the CREATE GENERATOR statement for the generator selected on the Generators page. If all generators are displayed on the Generator page (Display All Generators button), all corresponding CREATE statements appear on this page. Setting Values - displays the SET GENERATOR statement for the generator selected on the Generators page. Again, if all generators are displayed on the Generator page (Display All Generators button), all SET statements appear on this page. Full - displays the full SQL text for the generator selected on the Generators page (or all generators). Please note that the Scripts page is for display only. It is not possible to make any amendments on this page. Please refer to Table Editor / Comparison. Please refer to Table Editor / To-Do. A generator may be altered to specify a new value. The value of a generator can be changed as often as wished. This can be performed in IBExpert using the DB Explorer's Generator Editor, opened either by double-clicking on the generator name, or right-clicking and selecting Edit Generator [Ctrl + O]. Simply enter the new figure in the Value column, compile and commit. where n is the new value. This new value is immediately effective. Please refer to the ALTER SEQUENCE and SET GENERATOR statements for further information. In IBExpert, a generator can be dropped from the DB Explorer by selecting the generator to be deleted and using the '-' icon on the Generator Editor toolbar or [Shift + Del]. before finally dropping when the statement is committed. Beware that this command deletes the specified generator regardless of any dependencies that may exist.